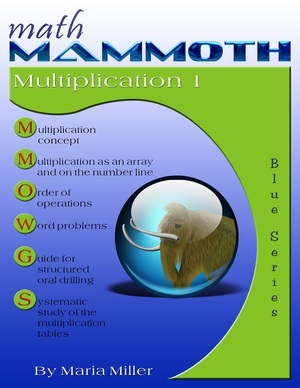 Frequently asked questions about the different series of Math Mammoth books. Please check out first this page, which contains an overview of the different series of materials, and includes some pointers as to which type of books to choose for many common situations. The video below gives you a quick introduction to the different series of Math Mammoth books, including also the Make It Real Learning series of books. 1. What is the difference between the Blue Series, the Light Blue Series, the Golden Series, and the Green Series? 2. Do the Blue and Light Blue have the same material? 3. Would the Blue Series cover the same information as the Golden Series grade-level sets? 4. Would the combo pack of Blue, Golden, and Green constitute a complete curriculum? 5. Are 3A, 3B, 4A, 4B... in the Light Blue exactly the same as 3A, 3B,... in Gold Series? 1. What is the difference between the "blue", the "golden", the "green", and the "light blue" series? The BLUE SERIES are topical worktexts with explanations and problems. A "worktext" means that it is a textbook and workbook combined. In other words, the 'text' and the 'work' (=problems) alternate. Each book covers a particular mathematical topic, such as addition, subtraction, clock, multiplication, fractions, measuring, or geometry. Blue Series books do not mention nor are they tied to any particular grade level. Most of them cover material on a particular topic for 2-3 neighboring grade levels. 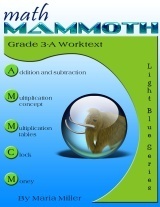 The LIGHT BLUE SERIES is a complete math curriculum for grades 1-7. It goes by grade levels. Each grade level consists of two student worktexts (A and B), answer keys, tests, cumulative reviews, and a worksheet maker. The student worktexts are similar to the Blue Series books in the fact that the worktexts contain both explanation and teaching of the concepts, plus exercises and problems. 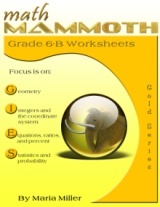 School teachers who need supportive materials for students of various abilities, or who wish to use Math Mammoth as their main instructional material. The GOLDEN SERIES are grade level collections of worksheets: one-page worksheets filled with varying problems. These books do NOT contain explanations of the concepts. Each one-page worksheet concentrates on a particular topic. The Golden Series worksheets are especially useful for teachers and tutors who need to have worksheets to give for homework or classwork. They are also useful for review. However, since the books do not contain the instruction, they do not serve well parents who cannot or do not wish to explain the mathematics themselves. 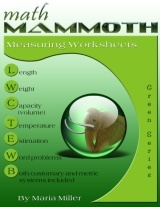 The GREEN SERIES are collections of worksheets by topic. They are similar to the Golden Series books: one-page worksheets without any explanations. Each Green Series book concentrates on one particular topic, and contains worksheets of various difficulty across several grade levels. These ar, again, perfect for teachers and tutors. The material in them is taken from the Golden Series grade-level collections. Practically so. There are only a few very minor differences: few pages here and there that are in one series but not in the other. Generally no, because the Blue Series books contain much more, because they contain the explanations of the concepts. The Golden Series books are worksheets (problems) only. It would for grades 1-7 — please see Blue Series FAQ, #1. It wouldn't for grade 8, because the Golden Series is NOT a complete curriculum: it does not contain the explanations. The Golden Series is complete as far as the topics it has problems about, but all it contains is problems. The same is true of Green Series. No. The Light Blue and Golden were written at different times and for different purposes, so they are not written to match each other. The Golden is an earlier work, written for a tutoring company. The Light Blue is a later work and written as a complete curriculum.